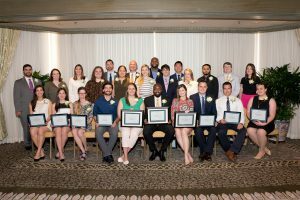 University Medical Center New Orleans hosted its annual Intern and Resident of the Year Luncheon at the Windsor Court Hotel on June 2, 2017. Each year the hospital accepts nominations for Interns and Residents of the Year from departments. Nominated candidates should demonstrate dedication to the care of patients, an interest in teaching students and residents and an interest in research. Members of the UMCNO Executive and Credentials Committee select the winners. Guests in attendance were welcomed by Bill Masterton, Chief Executive Officer, Dr. Peter DeBlieux, Chief Medical Officer, and Dr. Robert Maupin, President of UMCNO Medical Staff Services. Certificates were presented to all nominees. The Office of Graduate Medical Education would like to congratulate and recognize Dr. Jamaan Kenner Department of Obstetrics & Gynecology, for receiving the 2016-2017 LSU Intern of the Year Award and Dr. Shannon Palombo, Department of Internal Medicine- Medicine/Pediatrics Residency Program as the 2016-2017 LSU Resident of the Year. We would also like to congratulate three LSU residents who were recognized as Spirit of Charity Resident Quality Champions: Dr. Claude Pirtle, Department of Internal Medicine; Dr. Eric Wallace, Department of Radiology; and Dr. Bobby Mathew, Department of Internal Medicine. In addition, Dr. Kris Coontz, Tulane University Department of Internal Medicine, received the award. 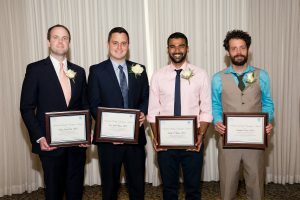 These physicians were recognized for their outstanding dedication and commitment to the development and implementation of the UMCNO House Officers’ Patient Safety and Quality Improvement Initiatives. Congratulations to all who were nominated!